As part of Katie's 2nd birthday celebration, we joyfully brought family and my best friend around us for a PRINCESS PARTY! 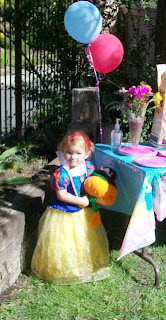 Katie has been really loving the Disney princesses, and since she wanted anyway to be Snow White for Halloween this year, we thought a costume-themed party would be perfect for her! We celebrated last Saturday, on a bright autumn day. We had so much fun crafting for days beforehand: Katie and I painted a dwarves' cottage together that Boppa made for us. She loves to paint, and what a happy memory for us! We made her party hat, an glittery trident for Daddy's King Triton costume, and more. I love involving her, and she was helpful choosing balloon and streamer placement. Snow White, Belle, Aunt Sharon as Cinderella, and second cousins as Sleeping Beauty and fairies. Katie tries on her party hat the night before the party. One of her books mentions party hats, and she said early on that she hoped for some! Uncle David helps with the pinata while Amie and Katie take a turn. Opening presents in Belle's Garden (we divided the yard into six sections, each featuring the colors and quotes from six different princesses). Snow White looks at her birthday cake. Katie has been really loving her play kitchen from Mommy and Daddy. It is in the house, underneath the countertop in the nook. We play in it everyday. She mostly pretends to make apple pie, but sometimes she microwaves the bad queen from Snow White as punishment for her wickedness. Actually, I could write a whole blog on our kitchen imagination play---we have a story going right now about opening a pie shop. She takes orders and sells her pies for "Two dollars." King Triton (who has put his trident down to make a thank you list). Happy birthday to you, Katie. Katie asked for chocolate cake with pink frosting. We decorated it with sprinkles and princesses. Princess Snow and Princess Rosa are ready for a party! Snow White's land... with mini tables for dwarves or young guests, the dwarves' cottage, and an apple tree. We had Katie's Year 2 scrapbook out on the table so that we could remember her year through pictures. The changes in one year have been immense!! The next day (Sunday) we finished all of our thank you notes, about 13 of them. I had started writing the content Saturday night and then Katie colored in them and made her marks of thanks while I addressed them the next day. I want to teach her about how important it is to write your thank you notes immediately and get them mailed. On Monday we mailed our notes at the post office and Katie (and "Cinderelly") hand-delivered her card to Amie and Boppa. We were truly fortunate to have such happy memories with our family. Good night, princes and princesses!